Truth and untruth as taught in the Southern school. One verse for each of the five watches of the night. In the first watch we start. Illusion and truth are not two different things. Misunderstood, truth is illusion; rightly understood, illusion is truth. When the images have vanished, nothing is found behind the images; when the original state shows, it is found to be selfsame and devoid of content. Acting, seeking, we cannot attain salvation; not acting, not seeking, we accomplish our work. In the second watch we press forward. The great round precious mirror rests firmly on its pedestal. Beings reaching for things are not aware of the disease they catch; they slam the door against themselves and their minds cannot open to the truth. They do not know that the mirror is always as clean as it was originally by its very nature, without any dust and stain; that they by nature are guiltless, unattached, not chained to the wheel of life. ‘All efforts to reach salvation are inadequate, are moves inside samsara’, if only the beings would recognize their own true face as that of the Tathagata whom they so eagerly seek. In the third watch we enter. The wisdom of the Tathagata is concealed in the dark depth of origin. Only buddhas can hand it down to buddhas. Shravakas and pratyekabuddhas are deaf to its music. They live in valleys deep in the mountains, stay in monasteries of the Dhyana sect; they enter into trance and `freeze their thoughts’. Not knowing that in one life one can achieve as much as in 80,000 kalpas of dhyana practice, they carry away the hemp of their gradual practices and pay no heed to the gold of sudden awakening. In the fourth watch we approach the end. We are not anxious to see the dharmakaya in its original glory. For, it might catch our fancy and make us attach to a purpose. A purpose is a deceptive thing and should be shunned. Let yourself go, don’t scheme; follow your own nature, be your own authority! Don’t moralize, that you may not deceive yourself! Free from self-deception, free from moral standards, you are in nirvana. In the fifth watch we close. 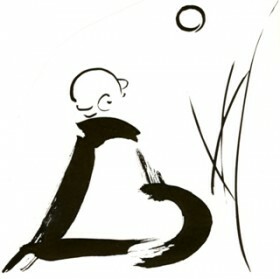 Bodhi is freedom from attachment; we have no root any more in the world of single things. How often in past kalpas have we sacrificed our lives without being able to attain bodhi. Therefore our teacher has told people that they should not hope for karmic rewards. He has supplied us with medicine, has thrown the gate wide open; he has removed the membrane hindering our sight, dispersed the floating clouds in our eyes. He has suddenly opened the Buddha-eyes of beings; he has taught them to recognize themselves so that they may not be drowned in the ocean of life. The genuine vehicle is surely not often met; universal order can be believed to be hidden deep. Those who wish to part with individual things and their negative counterparts must use their minds as a mirror reflecting their minds. In a hair tuft a pearl is lost; sewn in a garment a jewel is difficult to find. To those who carry hemp I say: why don’t you pay heed to the gold? This entry was posted in Uncategorized and tagged Attachment, Buddha. Bookmark the permalink.